While many useful sites aim to bring together volunteers with nonprofits in need of help, a recent trend seems to be toward job-specific matches. Technology and design help, in particular, are becoming easier than ever for nonprofit organizations to find. For cash-strapped organizations in a tough economy, this is a bit of very good news indeed. This could include anything design-related, from a banner to a new brochure, a website re-design to a promotional video.... Once you post your listing, it will be visible on Idealist as a volunteer opportunity. Then, ADC will reach out to designers all over the world to get them involved. For more information about how to post your listing for the Pro Bono Design Project (or any other listing at Idealist.org), see the FAQ on the site. Note that there is no deadline for listing — and it’s free for nonprofit organizations, although there is a fee for consultants to register and be listed in the consultants directory. CodeKindness.org, an initiative of the Public Learning Media Labs, aims to “mobilize technology professionals to contribute their skills to nonprofits and other social causes.” Both nonprofits and volunteers are invited to register at the site, and there is no charge for posting your technology-support needs. Interestingly, the site is designed to be self-sustaining through sales of T-shirts that nonprofits may choose to purchase to thank their volunteers. Do you know of any other places online where nonprofits can connect with professional designers, coders, or other professionals in the technology realm for pro bono help with specific projects? Please share your links and suggestions in the comments, below. Great post! 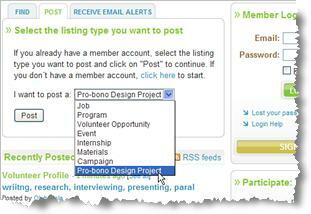 I was not aware of the Pro Bono Design Project at Idealist.Org. Happy to share a tip, John! If you are looking for a way to serve, but you hate leaving the computer, check out 10000strong.org. Its a place where you can go to get inspired, tell your story, and donate to the cause. Do your part this MLK day and visit 10000strong.org -- There is no excuse for hunger, help to fight it!